Be sure to oil/lube your motorcycle chain regularly, and the chain and both sprockets will last much longer. If it is time to replace something, it’s typically best to replace the chain and both sprockets all together. This is a good time to take a close look at your wheel’s spokes and tires too. Keep your motorcycle chain lubed every couple hundred miles and ensure it has the proper slack. This will keep the chain and sprockets in good condition for longer. Remove the front sprocket cover. If the chain is endless-type, you’ll need a chain breaker tool. If it has a master-link, remove the clip and the master link. Remove the lock tabs on the front sprocket bolt and remove the front sprocket. You’ll need a large socket. It helps to keep the bike in gear with the chain around the sprocket so you can keep it in place while loosening the bolt. Remove the rear wheel, unhook the lock washers and loosen the bolts. Replace with new sprockets, a new chain (being sure to get the correct size), and new lock washer. Tighten, align, and lube everything back up. For clip-type master link chains, the closed end of the clip should be facing the direction of travel. If you don’t have a special master link tool, you can use a vice grip and small sockets to get things clipped together. Be sure to apply even pressure to the to chain link if you do this. The easiest way to align your motorcycle chain is to make sure the rear wheel is installed at the same marks on each side of the swing arm. 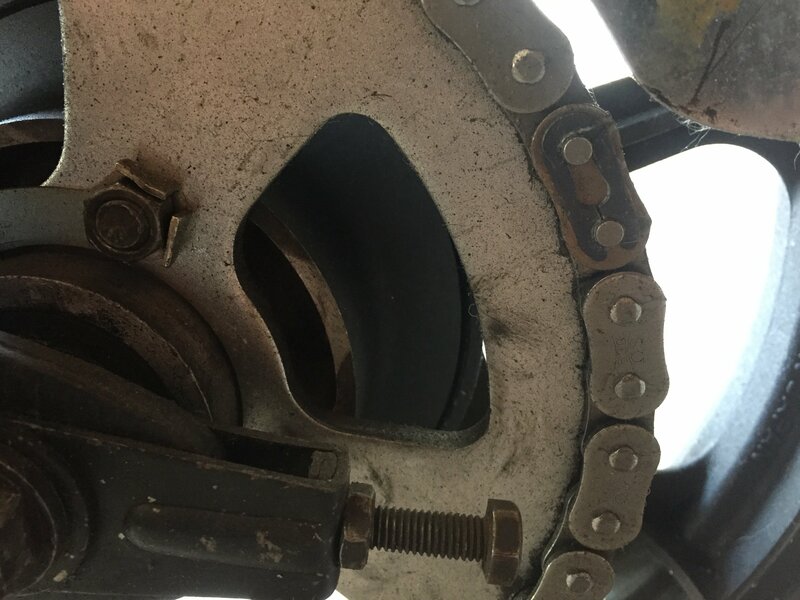 A chain that’s not properly aligned will wear itself and the sprockets much faster. When installing and servicing your chain, refer to your shop manual for the proper amount of chain slack you should have. A chain that’s too tight will wear too quickly and possibly break. A chain that’s too loose can slap around and possibly come off. The combination of the sprocket sizes you choose (as well as the size of your rear wheel) will affect your gear ratios. You can change the gear ratio from stock to alter how you bike performs at different speeds. If you want to lower your engine RPM a highways speed, you can either swap for a larger front sprocket or a smaller rear sprocket. You can use a motorcycle gear ratio calculator to mess around with different combinations.